Dirty North have stumbled around the Manchester underground scene for the past six years. Fusing reggae, rap and old-school rock, they've played the odd incendiary live gig to crowds that get their take on what it's like to grow up on a suburban housing estate. After a series of EPs and mixtapes of tracks they've recorded over the years and their debut Down In The Game, the appropriately titled Wythenshawe Dub is their second album, just as they go on an unspecified hiatus. It's available as a free download although you can (and should) pay what you like for it. The band feel that the record captures their live sound more than any of their previous releases and it's hard to disagree with them. Whilst it's drowning in its rap and reggae influences, it's equally as accessible to lovers of guitar music (the album's produced by James' guitarist Larry Gott) as the tunes are loose and languid, equally as home chilling out on the sofa at home or blasting through speakers in a club. Lyrically, the record lives up to the claim of the rap lyric of Hip Hop & Rap "I got to say it as it is, right from the heart man, got to get through to the people in the dark." It's an album full of attitude and stories from the streets. Whilst Fresh Bad Track tells of "it's kicking off in the (Wythen)'shawe" and there's references to their part of town throughout, it's a tale that could fit any working-class culturally diverse area of any city and that theme repeats itself throughout. The album isn't all bravado and stories of urban disorder though. Money & Guns takes a political slant, challenging the warmongers to take the place of soldiers on the front line rather than using the wars to line their own pockets. She Never Let Me starts as if it's a beautiful rough around the edges love song, but by the end you're wondering whether the "sweet Mary Jane" of the song isn't an entirely different subject to the one you thought at the start. The casual drug references are a little more obvious in Weed Life. In contrast, Summertime is a contemplation of life and what it means as it rains (inevitably) in the city when there should be sunshine. There's a couple of points on the record where the reference "music in my brain" comes across and it keeps coming back to the importance of music and this is a pointer to where Dirty North is coming from. It's from the hip, thoughts and concerns, everyday observations from three lads living in the rough part of town set to a mix of their record collections thrown up in the air and fused back together with an intelligence and an ear for rhythm and a groove that make it a fascinating and exciting listen even if you don't relate to the lyrical content of the songs. Wythenshawe Dub (as well as their other releases) is available to download on a pay-what-you-like basis here. 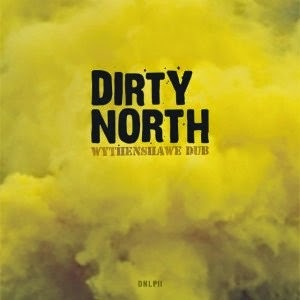 Dirty North are on Facebook and Twitter.